The way Montanans regulate seat belt use can be confusing. It is illegal in Montana for an adult to ride in a car or truck without wearing a seat belt. But a law enforcement officer cannot stop a vehicle just because they see someone not wearing a seat belt – they can only stop a vehicle for another reason, such as a broken tail light. At that point, they can write a ticket for the occupant failing to wear a seat belt. This head-scratcher of a regulation really matters. Many of our friends and neighbors die in accidents on Montana’s roads and highways each year. In 2015, Montana ranked third out 50 states in the most traffic fatalities per 100,000 people at 21.7. Montana also ranked second in the most traffic fatalities per 100 million vehicle miles traveled at 1.81 deaths per 100 million vehicle miles traveled (National Center for Statistics and Analysis). And 54 of the 124 people (44 percent) who’ve died so far on Montana’s highways in 2017 were improperly restrained, according to the Montana Department of Transportation (MDT). Clear scientific evidence demonstrates that wearing seat belts saves lives by reducing the risk of death in an accident by 45 percent and the risk of serious injury by 50 percent (National Highway Traffic Safety Administration). But the type of seat belt regulation a state chooses significantly impacts seat belt use in that state. 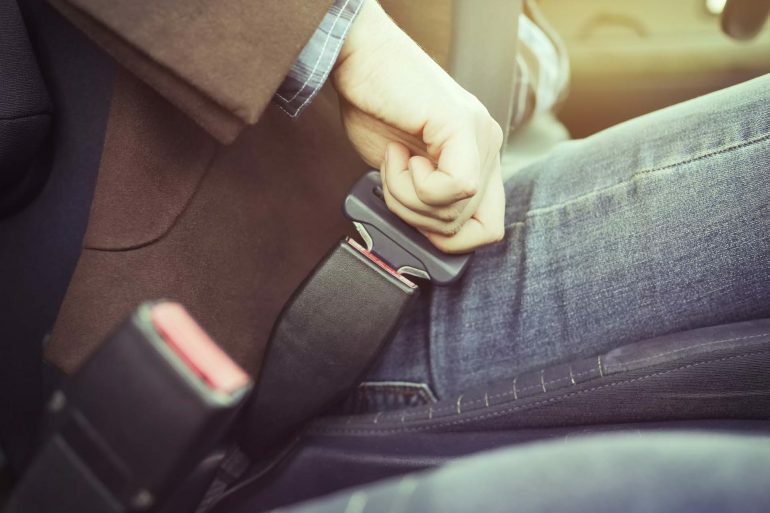 In 2016, 90 percent of people who lived in states that allowed law enforcement officers to stop a vehicle if an occupant wasn’t wearing a seat belt (enforcing a primary seat belt law) wore seat belts. Only 81 percent of people who live in states without a primary seat belt law wore their seat belts. Sadly, just 76 percent of Montanans wore seat belts in 2016. Over the past 10 years, the Bureau of Business and Economic Research has polled Montana residents to find out what they think about seat belt regulations in the state. The results exposed some perplexing views. Figure 1. Montanans’ support for or opposition to a primary seat belt law. 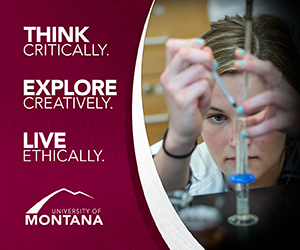 Source: Bureau of Business and Economic Research, University of Montana. First, a majority of adult Montanans (54.5 percent) supported a primary seat belt law for Montana in 2017, while 45.5 percent of Montanans opposed such a law. 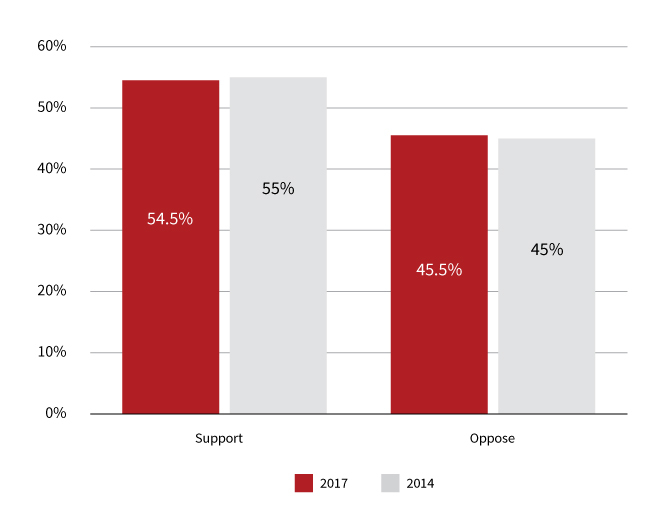 The proportions of support and opposition were nearly identical to those in 2014 (Figure 1). Second, most Montanans who opposed a primary seat belt law in 2017 (24.1 percent) cited their individual rights or protecting their right to choose whether or not to wear a seat belt as the reason they opposed a primary seat belt law. Figure 2 lists the reasons cited by opponents for their opposition of a primary seat belt law. Figure 2. Reasons for opposing a primary seat belt law. 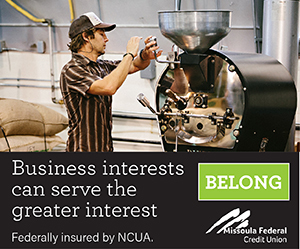 Source: Bureau of Business and Economic Research, University of Montana. In general, opposition to a primary seat belt law reflects some Montanans’ values for individual freedoms, a distaste for frivolous laws, suspicion of giving the state too many reasons to arrest citizens and concern about wise use of scarce state resources. Figure 3. Montanans’ support or opposition for a primary seat belt law for child restraint. Source: Bureau of Business and Economic Research, University of Montana. Third, the opposition to a primary seat belt law for adults does not transfer to an opposition for a primary seat belt law for children who occupy vehicles. Almost all adult residents in 2017 (93.7 percent), favored a primary seat belt law for children in vehicles (Figure 3). Only 6.3 percent opposed such a law. 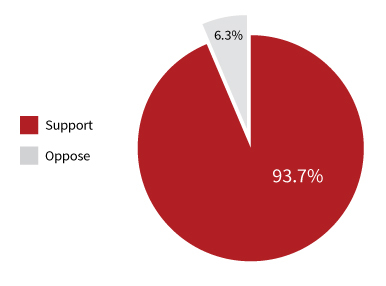 This nearly universal support for a primary seat belt law aimed at protecting children in vehicles is an interesting contrast to the bare majority support for a primary seat belt law for adults. Fourth, Montanans’ nuanced views on seat belt regulation extend not only to making a distinction between adults and children, but to whether or not a primary seat belt law would save lives. The Bureau of Business and Economic Research asked 1,400 adult Montanans whether a primary seat belt law would save lives. 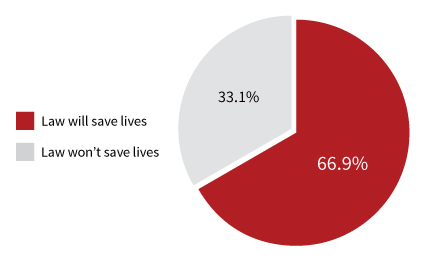 Two-thirds (66.9 percent) said that a primary seat belt law would save lives, while one-third (33.1 percent) said that the law would not save lives (Figure 4). Figure 4. Montanans’ opinion on whether or not a primary seat belt law would save lives. Source: Bureau of Business and Economic Research, University of Montana. Since 66.9 percent of Montanans say that a primary seat belt law would save lives, but only 54.5 percent support a primary seat belt law, how does one explain the views of the other 12.4 percent who oppose the law, but think it would save lives? Our polling only allows us to speculate, but one intriguing possibility is that some Montanans place a higher value on protecting their personal freedoms than saving lives. A second interesting and unresolved question is raised by the observation that two-thirds of Montanans said a primary seat belt law would save lives. The statements of one-third of adult Montanans in 2017 that the law would not save lives, are directly contradicted by readily available and well-known scientific evidence. That contradiction really is a head-scratcher. 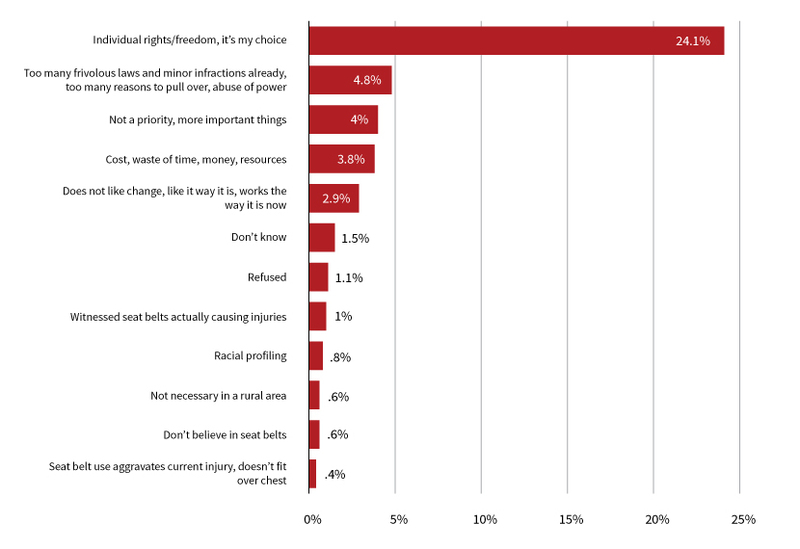 In summary, a majority of adult Montanans favor adopting a primary seat belt law. Almost all Montanans favor protecting children with a primary law for child restraints in vehicles. And two-thirds of all adult residents say that adopting a primary seat belt law would save lives. These three facts strongly support the adoption of a primary seat belt law in Montana. Montana’s last attempt to pass a law providing for primary enforcement of seat belt laws, Montana Senate Bill 9, died in committee this past April. Perhaps Montana legislators will look at public opinion and reconsider the proposal in 2019.